Starting with Windows Server 2012, it is possible to create a data deduplication-enabled volume. On such a volume, the deduplication driver periodically launches and scans the content of the files trying to pick out the identical data fragments. When duplication data is found, only one copy goes to a special storage while file metadata is updated so that to store the pointers to a corresponding storage. 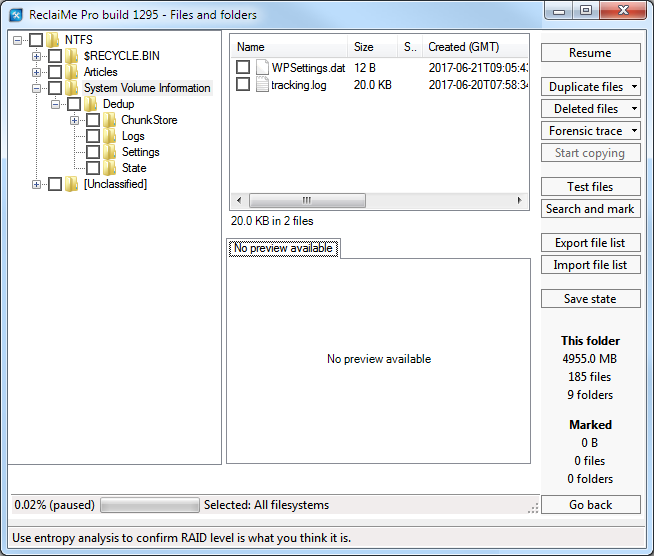 At the filesystem level, such storage is organized as special containers (files) stored in the Chunkstore folder under the System Volume Information. At the moment deduplication is only supported on the NTFS data volumes. When the size of a container reaches about 1 GB, the container is sealed and a new one is created to store new coming data fragments. All the data fragments are compressed before placing into a container. Now ReclaiMe Pro can recover data from the deduplicated NTFS volumes. No special settings required, ReclaiMe Pro automatically unpacks data from the deduplicated containers when you preview or copy the optimized files. The only thing you need to be aware of is that when restoring data from a data deduplication-enabled volume you should avoid copying the contents of the System Volume Information folder because doing so you get two amount of optimized data – at the original location and in the deduplicated containers.